It’s time to lace up and honor the sacrifice – Boots for Troops is back! Ruck, Walk, or Run in honor of our fallen military service men and women and in support of their surviving families through either a 5k, 10k or Half Marathon distance. 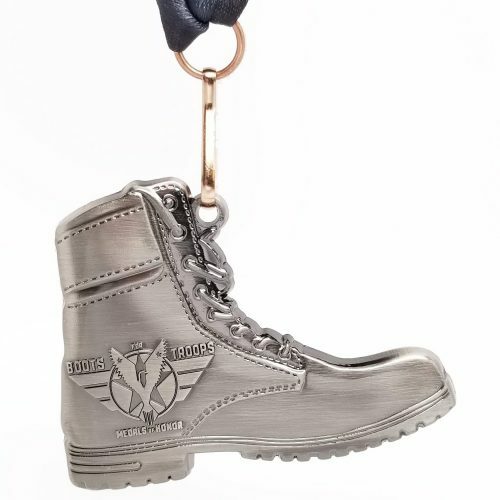 Combat boots are highly encouraged but not mandatory; running shoes are welcome. Run, walk or ruck your selected distance whenever and wherever you want to spread awareness and support the cause. All participants will receive a 3.5″ medal in the shape of a combat boot. All proceeds from this virtual fundraiser will be used to help off-set expenses to send surviving family members (Gold Star Families) and veterans to the 2019 Bataan Memorial Death March. Thank you for helping us to honor the sacrifice! Medals of Honor is a national 501(c)3 awareness campaign. We give the endurance/race community a tangible way to thank and give back to the families that lost loved ones while serving our Military. 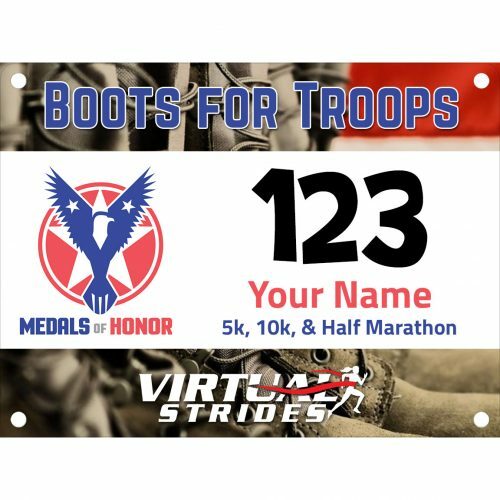 Through Medals of Honor, racers can compete in honor of a fallen U.S. service member and donate a finisher’s medal to the surviving family. We cultivate a healing environment that helps to bridge the gap between surviving families, veterans and civilians. We promote healing through endurance type sporting events, while promoting patriotism and gratitude for active duty, retired and veteran military personnel. CONNECT — Active duty Military, Veterans, Civilians and Surviving families through endurance sports and fitness. MoH is a 100% volunteer-run 501(c)3 organization founded and run by military families and veterans. Donations go directly towards operational support of the organization and programs such as Remembrance Packages (to families of fallen), Memorial Back Bibs and Enduring Heroes. Please visit our website for program details. Virtual Strides Partner Event: This event is part of the Virtual Strides Partners Program. Medals of Honor will receive 100% of the net proceeds from this event after Virtual Strides’ partner costs are deducted.